Sometimes you see a recipe and you immediately get into the kitchen and make it, no matter what. This was one of those times. 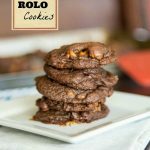 I am not sure how I found the recipe for these cookies, but the second I saw them I had to make them. I wanted to bring something to our friends for the weekend, so it was the perfect excuse (not sure I was going to need an excuse, but it was a good one). I had bought a bottle of Malted Milk Powder awhile ago, because I was thinking of making something with it, so I even had what I needed in the house. It was Fate, I tell you! Or tell myself, to justify it. Whatever works. These cookies were so good! Fresh out of the oven, down right amazing! Even after they were cool, the center was soft and chewy. You really do have to be careful not too bake them to long. The instructions of slightly under baking are key. My last tray came out a little more done that I had intended. Still good, but crispy and just not the same. 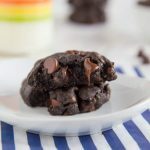 Do yourself a favor, go make these now. They really are one of the best cookies I have had in awhile. 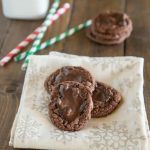 Thick and chewy malt chocolate cookies that are loaded with 2 kinds chocolate. In a large bowl combine Crisco, brown sugar, malted milk powder, chocolate syrup, and vanilla. Mix very well. Add the egg. In a separate bowl mix together flour, baking soda and salt. Add to the dough gradually, mixing well after each addition. 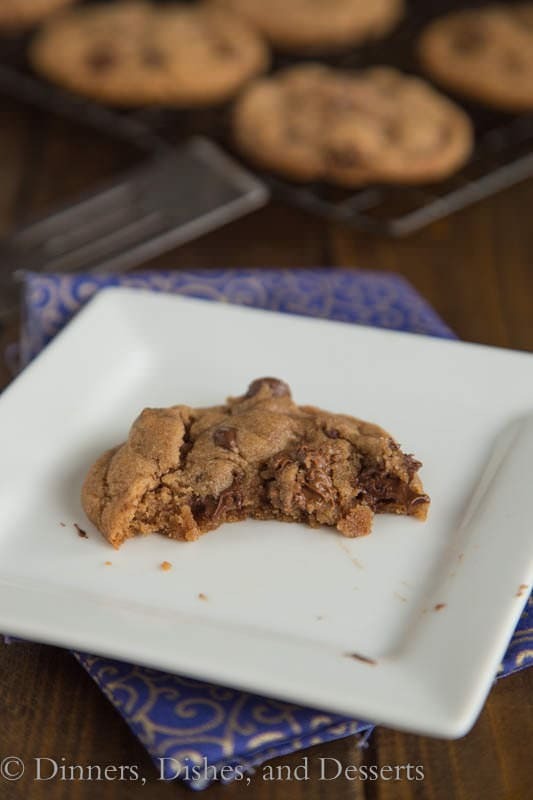 Using a spatula mix in chocolate chunks and chocolate chips. Shape the dough into 2 inch balls. Cover and refrigerate for 30 minutes. Preheat oven to 375 degrees. Bake for 8 - 12 minutes (11 minutes was perfect for my oven). The Middle will be slightly underdone and still puffy when you take them out of the oven. Allow to cool slightly then remove from tray, and cool on a wire rack. 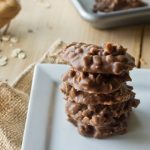 I have been wanting to make malted cookies for awhile now. I really need to get with it because these sound so good! 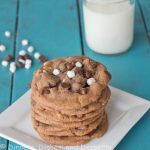 I looooove malts, and these cookies look utterly perfect. 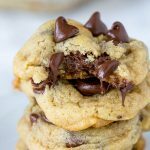 The chocolate chips are still molten, just the way I absolutely love it. 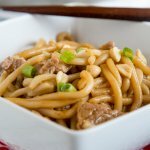 Great, great recipe that has me salivating! I have come to learn that you are the queen of desserts. Seriously! These look amazing! 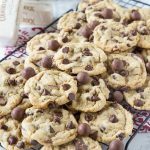 I need to try out this malted milk powder…second recipe that I’ve seen this week using it and it sounds amazing! 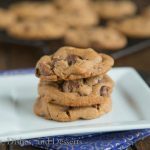 They look super moist and chewy, my fav kind of cookie! Must try! Ah need these in my life right now! These look SO GOOEY and delicious!!!! Yummy!! When I was younger I worked at a small local ice cream place and that was where I first tried malts. I loved them and still love anything with the malt flavor. 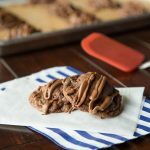 Cookies that I can carry around and eat with no worry about brain freeze? Yep! I’ll take them! mmm i have a small obsession with malt. We can’t get the carnation stuff up in Canada so I have to go to the States to restock then I will totally be making these cookies. Oh yum! 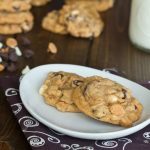 Can’t say that I’ve ever had MALTED chocolate chip cookies before, what a great idea! Love this twist on a classic!! These cookies look so thick too, just the way I like them! And I have malt powder that needs to be used! These look amazing. Malt is one of my favorite flavors! 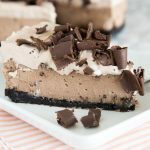 My favorite cake recipe has malt in it – it just goes so well with chocolate! I have to make these as soon as possible!!!! I saw these on Pinterest and knew they would be wonderful. I couldn’t wait to see the recipe. 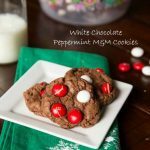 These cookies look amazing!! 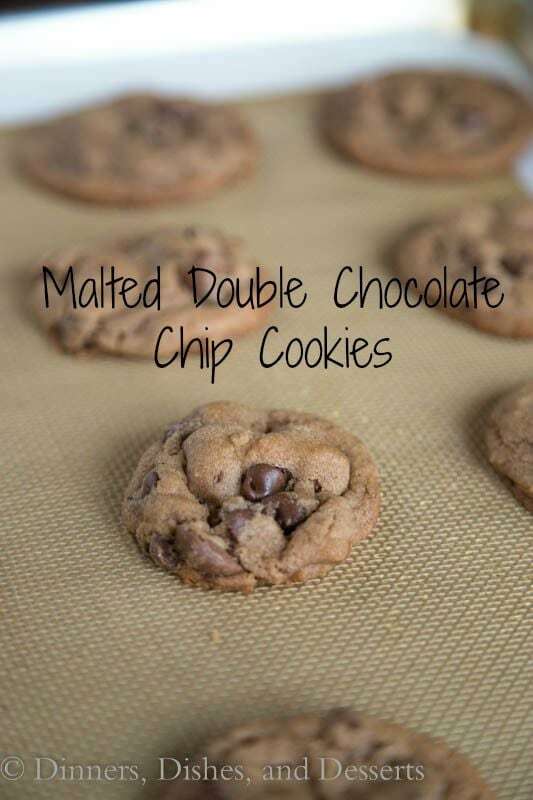 I love malted milk powder and def need to try these! Wow – they look absolutely decadent! 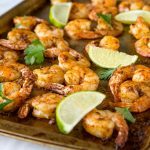 Fantastic recipe and your pictures are absolutely perfect! 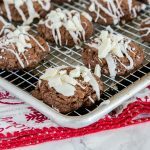 Sounds like I have to make these cookies just like you felt after seeing the recipe! 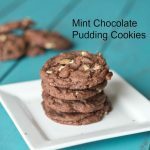 I’ve been trying to be very good about losing weight…but blog hopping is making me way too hungry for sweets! I’m OBSESSED with malted things, and can’t find any malted milk powder anywhere!!! I think I’m going to give up and buy it online! 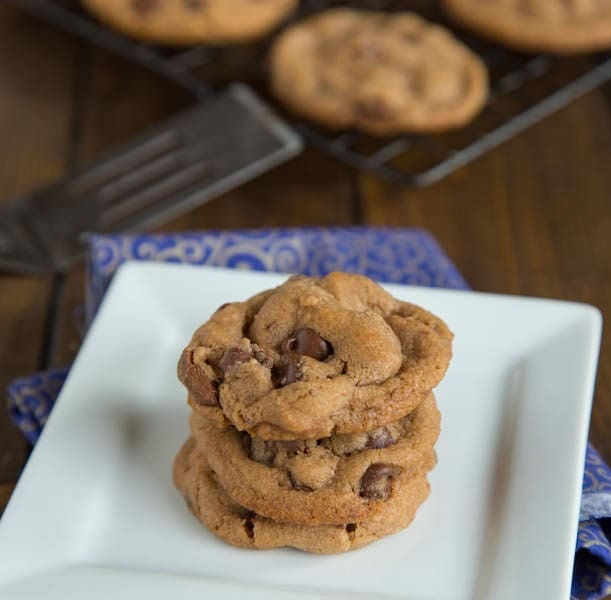 Bookmarking these cookies! I FOUND MALTED MILK POWDER!!!!!! WHOOP DEE DOOO!!!!!! LOL can’t wait to make these!!!! These were SO good Erin!!!! My husband and I ate way too many tonight LOL. Yeah!! So glad you liked them! I always-always LOVES chocolate cookies, yesterday I read Lizzy post which is the chocolate cookies and now ur post! what a themting and a remainder for me to make one again in the kitchen! Tq erin! yes, sometimes I just have had that same fate as yours, I think not only in a love section there something called fated, even in the food section! Haha ha! These cookies look delicious! I love chocolate chip cookies. I work for Kamut International. 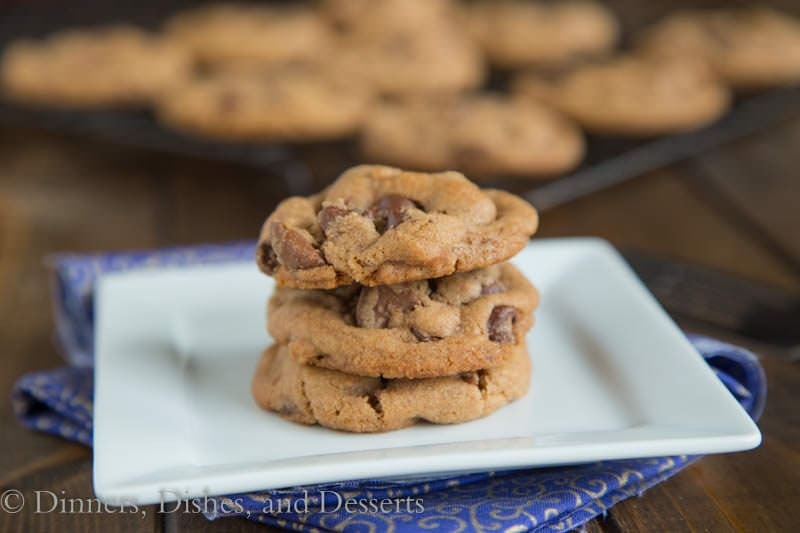 I bet these cookies would be equally as tasty if made with Kamut wheat flour. I should avoid your blog..:))) well not really but girl those cookies..ahh they look amazing! I took a little pause since they are making my mouth water, and craving for something really sweet! Well done!!! I got my package of these in the mail today. Which I promptly tore open and devoured one or five. OMG. I’m not even a chocolate fan and these are simply DIVINE!!! Thanks Erin. These are FAB!! !